The third season of BBC America’s critically acclaimed Orphan Black picked up right where it left off. Once again the defiant Sarah Manning (Tatiana Maslany), brainy Cosima Niehaus (Tatiana Maslany), and straight-laced Alison Hendrix (also, somehow, Tatiana Maslany) are cascading through the Orphan Black universe as technologically impossible clones (as discussed in two previous blog posts, found here and here), but they sure don’t act like clones. Or do they? (In contrast, the newly discovered male clones (each played by Ari Millen IMDb Page) seem consistently menacing so far.) While Project Leda clones look alike and share a genome (manufactured by the Dyad Institute, which is helmed by the psychopathic Rachel Duncan, who is also played by Ms. Maslany), they sure don’t seem to have much else in common. When a mutation compromises the ability of the BRCA1 protein to repair DNA, the risk of breast cancer can increase by as much as 80%. But how can this be? Don’t our genomes decide who we are? Why do the clones all seem so very different if genes determine everything from height and eye color to the development of illnesses such as schizophrenia (from which Helena, once again portrayed by T.M., may suffer), some types of cancer, like breast and ovarian cancer caused by defective BRCA1 (pronounced BRACK-a one) and BRCA2 genes, and maybe even some of the clones’ mysterious respiratory problems? In brief, if so much is predetermined by genes, then what isn’t predetermined by genes? 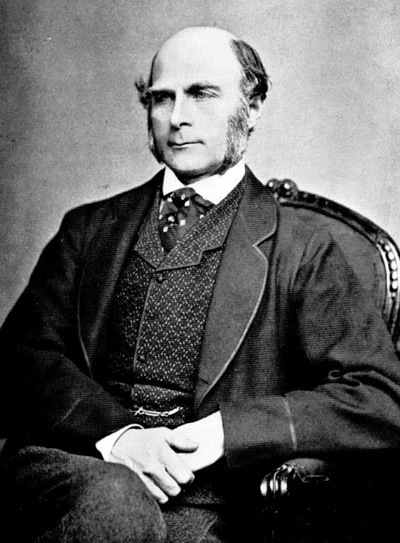 Francis Galton was Darwin's cousin and one of the earliest contributors to evolutionary theory; however, he was also the first eugenicist. Does "Nature" or "Nurture" explain the personalities of the clones? This question would be a lot easier to address if the real world contained actual human clones to study. Luckily, there is a type of natural human clone—identical twins. Charles Darwin’s cousin and the great-grandfather of human genetics, Francis Galton, was the first person to suggest that studying twins could shed light on the relative influence of nature and nurture in human development in his 1875 paper, “History of Twins.” By the way, Galton was also the father of eugenics, the repugnantly racist, pseudoscientific movement seeking to improve mankind through forced sterilization and selective breeding. As you might recall, eugenics was the focus of the Dyad Institutes’s defunct affiliate, the Cold River Institute (featured in episode 6 of season two, To Hound Nature in Her Wanderings). Without the benefit of modern analytical approaches and large data sets, Galton was forced to seek out anecdotal evidence (i.e., he became pen pals with a few dozen pairs of twins), from which he concluded that nature always predominates over nurture, thus supporting his insane eugenic perspective. But let’s slow down a second. Has Galton’s conclusion that nature always bests nurture withstood the test of time? Not exactly. Galton’s ideologically motivated research preceded the discoveries of genes and DNA as the mechanism of inheritance. Furthermore, he did not distinguish between fraternal and identical twins, as contemporary thought did not even realize this difference existed. Because identical twins are genetically identical (i.e., they share all genes), when they both exhibit a trait or disease, one or more shared genes is the likely cause. Galton implicitly assumed all twins were identical, though fraternal twins only share some genes. Leveraging this key genetic difference has made the study of twins a powerful method for testing the relative importance of nature and nurture. Twin studies have had a huge impact on our understanding of what makes me me, you you, and (presumably) each of the clones of Orphan Black unlike her sisters. Modern twin studies (like those carried out by the Minnesota Center for Twin and Family Research, Michigan State University Twin Registry, and Swedish Twin Registry, which contains nearly 200,000 twin pairs) take two forms. The first type compares fraternal and identical twins raised within the same households; the second looks at identical twins separated at birth. Identical, or monozygotic, twins form when a single sperm fertilizes a single egg to produce a single zygote, which then mysteriously splits into two embryos that eventually become two genetically identical humans. In contrast, fraternal or dizygotic twins occur when two separate sperms fertilize two separate eggs. Because of this key difference, identical twins share a genome and are effectively natural clones, while fraternal twins are just siblings that share a birthday. Identical twins are virtually 100% genetically identical, while fraternal twins share, on average, 50% of their genes, sometimes more, sometimes less. Because most twins, fraternal and identical, are raised within the same household, with the same rules, values, diets, school districts, pet parakeets, soccer coaches, and (most perhaps importantly) parents, any increased similarity among identical twins relative to fraternal twins must be due to genes; the more identical twins that exhibit a similar trait, the more likely it is a result of shared genetics. In other words, comparing the degree of similarity between identical twins with that of fraternal twins allows geneticists to examine only nature because all of the effects of nurture cancel out. 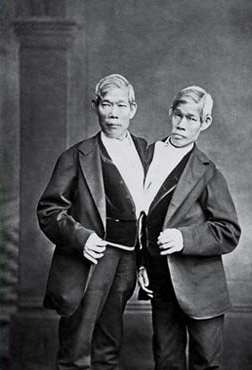 It would have been impossible to separate Chang and Eng Bunker at birth in 1811. Conjoined twins like the Bunkers are genetically identical twins who are particularly attached to each other. The second type of twin study is in many ways the opposite of the first as it looks at the influence of nurture instead of nature. This is much harder to accomplish because it considers only identical twins who were separated at birth—much like Sarah and Helena. As revealed in season 1, Helena and Sarah, are not just clones, but actual identical twins who shared the same womb. However, Helena was raised in a Ukrainian convent while Sarah was raised by an IRA-affiliated political extremist, Mrs. S. (Maria Doyle Kennedy). Therefore, any differences between the two sisters (like Helena’s hallucinations) should be due to nurture, i.e., the harsh upbringing and possible torture she experienced as a child. Conversely, we can probably attribute any characteristics they share (like their unique ability among the Project Leda clones to become pregnant) to nature, i.e., genes. However, it's tricky to compare Sarah and Helena to reality because modern adoption agencies desperately try to place twins into families together. The intentional separation of twins is considered improper. (Ethical concerns have caused one such study, referred to in Identical Strangers: A Memoire of Twins Separated and United, to be locked away by Yale University until 2066.) Accordingly and fortunately, there are not many of these “separated at birth” studies to consider—we cannot compare the separation of Sarah, Helena, and their sisters to an established real-world baseline. We must instead to restrict our attention to the more humane comparisons, some of which do not require twins at all. Though we cannot yet clone humans, we can certainly do a lot more than look at similarities among twins to address the relative importance of nature and nurture. For example, we can dig into the genomes of twins and everyone else. While twin studies are shockingly simple, our modern understanding of the influence of nature and nurture has taken a decidedly technological shift. When geneticists in 2015 want to determine if some observable, measurable human characteristic is influenced by genes, they simply sign up tens of thousands of unrelated strangers, measure their characteristics, and take a peek at thousands of DNA markers throughout each participant’s genome. Easy, right? This remarkable feat requires powerful computers, cutting edge molecular biology, and piles of cash. These studies, called genome-wide association studies, statistically link genetic markers from thousands of participant genomes to traits ranging from height and weight to alcohol dependency and IQ. The product of these studies is two-fold. First, they identify the genes that cause diseases and account for visible differences among human beings. Second (and most important for our purposes), these studies estimate how much of each of our traits, from depression to heart attack risk, is caused by our genes. By and large, genome-wide association studies agree with twin studies; that is, when one type of study consistently indicates that a particular trait is controlled by genes, so too does the other. However, because of the enormous number of statistical tests within individual genome-wide association studies (equal to the number of genetic markers multiplied by the number of traits measured), they tend to lack the power of the simpler and cheaper twin studies (so let's focus on those). So what have we learned from over 100 years of twin studies? The results (reviewed quite well here) are fairly mixed. Some physical traits, such as height, type I diabetes incidence, and body mass index, are almost always shared by identical twins, and thus a product of genes, i.e., nature. However, a slew of behavioral disorders are also rather consistently shared by identical twins. This includes impairments ranging from ADHD and mild learning disabilities to autism and schizophrenia. These psychological conditions are more consistently owing to genes than physiological medical conditions like asthma, blood pressure, or cholesterol level, which are mainly influenced by environment and lifestyle. Why is Sarah so different from her sisters? For the time being we should probably exercise a small amount of common sense and infer that Sarah’s politically radical foster mom, Helena’s rearing with abusive nuns (with a subsequent brainwashing by the Proletheans), and Alison’s stereotypically suburban upbringing likely contributed somewhat to Sarah’s antiauthoritarianism, Helena’s insanity, and Alison’s more-or-less stereotypical suburban existence. While twin studies often link these sorts of complex traits to genetics, the clones are nearly genetically identical and there are ultimately many other contributing factors (again, including epigenetics). Simply put, to test nature and nurture within the context of Orphan Black, we’ll need to know lots more about both the clones’ synthetic sequences and their histories. Do the genomes of Sarah and Helena actually encode for their fertility? Did Alison’s adopted parents abuse alcohol? Was Rachel mistreated by Dyad? Ferdinand the “Cleaner” (James Frain) hints at just this in the climax of the season 3 premier (to Sarah, posing as Rachel, of course). “Poor damaged Rachel. What happened to you? What’s behind that face?” It’s possible that Helena isn’t the only clone who would have benefited from an adjustment to her nurturing.